I make two basic types of vases, the drilled vase and the hollow vase. Mostly I prefer the drilled vase because it's unnecessary to hollow it out and the weight of the wood helps keep it stable. When a vase is hollowed out to a uniform wall thickness it becomes quite light and it takes very little to knock it over when it has branches or flowers in it. Drilled Juniper Vases, one with glass insert so water can be used for live flowers. Birch root burl, dyed with 3 colours, yellow, orange and green and dyed with 2 shades of blue. Drilled birch burl vases dyed with 3 colours, yellow, orange and green. 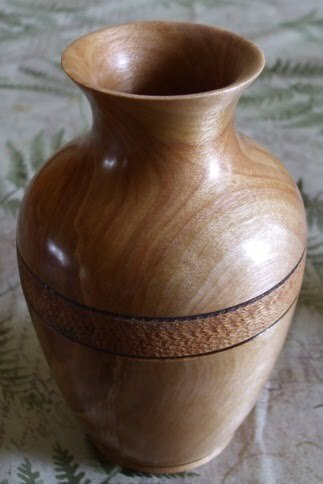 Elm drilled vase, carved and dyed. While this vase was drying it developed a split, so I enhanced it. by carving the edges and dying the inside. A couple drilled vases made from Boxelder Burl. Colour is natural. Flowers are Boxelder with colour added. The colours in the flowers are actually much lighter than show in the photos. 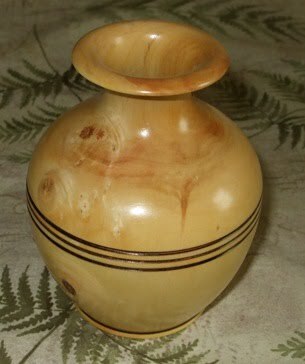 Drilled Mountain Ash vase with tulips. A couple small Birch Burl vases with aniline dye. 3 Drilled, Beetle Killed Lodgepole Pine vases, ranging from 12 16 inches tall.